The gateway musical passion for Klara Söderberg were albums from Bright Eyes. Once inside, the 12-year old followed the threads back to songs of Johnny Cash, Leonard Cohen, Emmylou Harris, and Bob Dylan. Her older sister Joanna had a wide-range of musical tastes though hearing the Brother, Where for Art Thou soundtrack prompted Joanna to duet with her sister. The success of their harmony led Joanna and Klara Söderberg to begin performing together, at home before venturing out to busk on the streets of Stockholm in their homeland of Sweden. 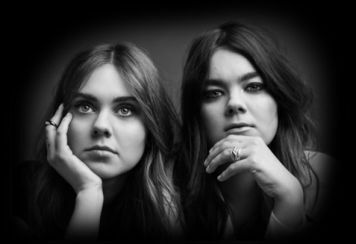 The duo began to compose their own songs soundtracked with a mix of Country and Folk music, opening a dictionary and landing on First Aid Kit as a band name. 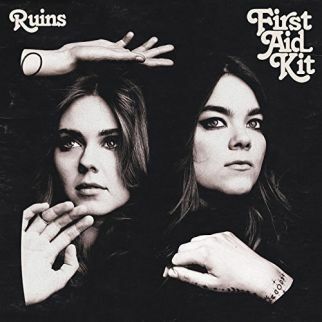 Still in their mid-20’s, First Aid Kit offer album number four with the recent release of Ruins. Saddling up and riding a Cosmic American Music range on Ruins, First Aid Kit put a gentle sway in the California Country tones of “Postcard” as the duo soundcheck Gram Parsons in the song, and borrow Gram’s shout out to his guitarist of ‘pick it for me, James’ (Burton) as the sisters encourage the piano to take the lead. Ruins picks its way through a wide Roots landscape, quick strumming acoustic chords for the tale in “Hem of Her Dress”, flickering notes like light flashes in a night sky as a backdrop for “Fireworks”, slowly plucks melody from the somber realizations of “Nothing Has to Be True”, and uses a Folk Rock rumble for the title track. First Aid Kit drift in the past to understand future actions with “It’s a Shame”, make a wish on “Distant Star” with one-voice harmonies, and pen a letter with gently picked notes for “To Live a Life”.